Moving from one home to another is never an easy task, but it’s even more difficult when you have to move your pets with you. When you’re driving long distances with pet rats, there are certain things you need to consider before and during your trip. What kind of vehicle or vehicles will you be driving, and how much room must you allocate for transporting your animals? Since we were moving the contents of a three bedroom house from California to Massachusetts, we needed a large truck. We also had two of our own vehicles to transport. We rented a dolly to haul our small pickup truck behind the U- Haul, but didn’t feel safe about transporting any of our pets inside the cab of the truck on the dolly, since there would be no air conditioning running and we could not monitor what was going on with the critters. We also knew we couldn’t carry any of the animals in the back of the U-Haul truck since you never know if there is a small hole somewhere in the floorboards that will allow carbon monoxide to enter, which could kill the animals. Instead, we decided to use my vehicle to transport the majority of the animals, while I followed along behind the U-Haul. Planning to carry the two dogs in the back of the Toyota 4Runner and the cat in her carrier in the cab of the U-Haul with my husband, I realized that the only space left to carry all 21 of my domestic rats and my five African Giant Pouched rats was the back seat and the front passenger seat of the 4Runner – obviously a very tight squeeze. I realized that, for the comfort and safety of the rats, I would need to have some custom cages made since their own cages would never fit in the car. Their normal cages could be transported empty in the back of the U-Haul. First, I needed to figure out how many groups of rats I needed to have cages made for. 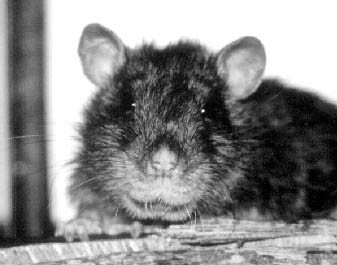 My five African rats were living in three separate cages, and I had three groups of domestic rats: one group of 10, a group of eight, and a group of three. None of these groups could be combined. I knew I could only put one cage on the front passenger seat, since while traveling across country, I would need to put music CDs, my purse, and other such things within my reach. I decided that it would be okay for the three boys to live in a Fern #940 for the week it would take to make the trip. I contacted Leo Braun of Fern Manufacturing for the other five cages I needed. I had him take the standard size #960 cage and shorten it to 15 inches in height and make it without any shelves. I was amazed at how much room this actually was. The rats obviously couldn’t run around, but they weren’t totally cramped, either. I lifted the seat like you do in sport utility vehicles to be able to put the back of the seat down to open up the entire back, but didn’t put the back of the seat down so there would still be a separate compartment in the back for the dogs. This gave me more head room for the cages. I placed three of the cages side by side on the bottom and stacked the other two on top. It was a perfect fit. I placed heavy cardboard between the cages and the car seats to ensure that no bored rattie teeth made quick work of my upholstery. I also placed heavy cardboard between each of the cages to guarantee there would be no toe biting between rats who did not know each other. We were traveling at the beginning of October, so it was still pretty warm and I had my air conditioning on when necessary, but it’s very important to remember that sunlight streaming in through the windows magnifies the heat and can be too much for our delicate little rats. However, well placed pieces of thick cardboard is all it takes to keep the sunlight out of their cages. Osgood, happy to be in his new home. While you’re driving, you can’t have water bottles attached or the movement of the ball bearing will make the water leak out and soak the cage, which will make for some pretty sick rats. Stop at least every few hours and attach a bottle of water to each cage to give them a drink. If you have lots of rats in one cage, you may want to attach a couple of bottles, but you will still need to give them enough time to quench their thirst. Also, be sure the water is cool. If the water bottles are stored somewhere in the vehicle that is in the sunlight, the water can become very hot in a short amount of time, making it unpalatable to the rats. I recommend carrying a small cooler with ice in it to keep the water bottles in while you are driving. You’ll want to have one for your own water and sodas anyway, so it can perform double duty. Make sure all of the supplies you might need for your rats are easy to get to. Water, food, litter, and medications should be readily available just in case you might need them during one of your stops, and should be packed in enough containers that are easy to take into your hotel room with you at night so you can change dirty litter, give fresh food, refill water bottles, and medicate any rats who are already being treated, or who may become ill during the trip and need treatment. Remember to bring along extra hiding boxes and rattie blankets (rags, old t-shirt material, etc.). In small quarters with many rats, these items need to be replaced very frequently. For the health of the rats, you will want to keep the cages as clean as possible while making a long trip, but for your own nose, you will want to keep them extra clean. It doesn’t take much urine and feces to become overpowering when you have your air conditioning on and all of your windows rolled up! You shouldn’t have any problems with this if you change the litter every night. However, if you’re giving them lots of fresh foods, fruits and vegetables in particular, it will become very stinky even before you make it to the hotel! It’s best just to make those frequent stops for water and forget about the fruits and vegetables until you’re settled into your new home. It won’t hurt them to eat lab blocks and grain mix while you’re traveling. You can try to make reservations in advance at motels or hotels that allow pets, but as much as you think you’re going to be able to stay on your scheduled itinerary, something inevitably happens to put you off schedule. Once that happens one night, you’re off for the rest of the trip. It happened to us on the very first night, so all of our advance reservations were useless, and one of the hotels even went ahead and charged our credit card anyway because we weren’t able to call to cancel the reservation. My recommendation is to find out in advance which hotel and motel chains accept pets, have each of them send you a listing of their locations, and look in the list a few hours before you plan to stop to see which one is close by. The most important thing is to think of every possible circumstance that could happen where your animals are concerned, and make sure you’re prepared to handle each of those situations if they arise. Moving is definitely work, but it doesn’t have to be a terrible experience for you or your animals as long as you plan everything well in advance.